For the first time in a long time, I had a reasonably free weekend. 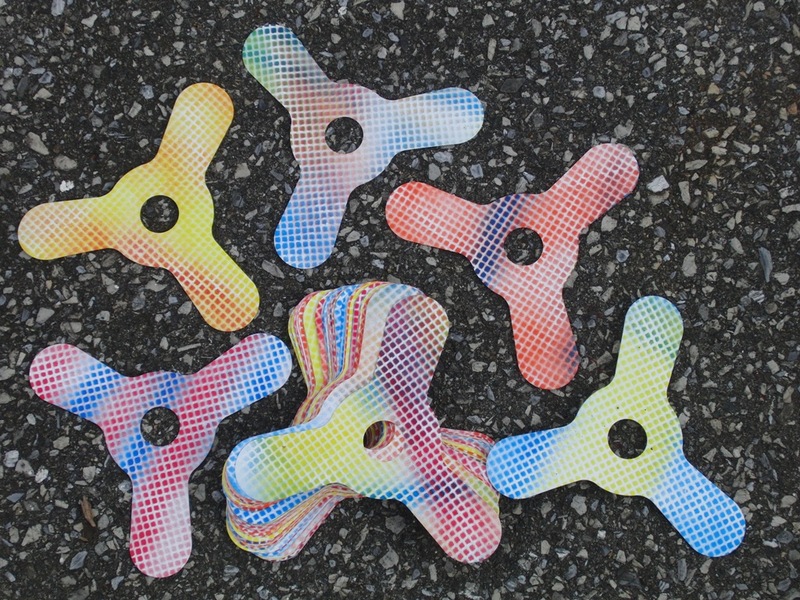 The weather wasn’t bad so I headed outside to make boomerangs. 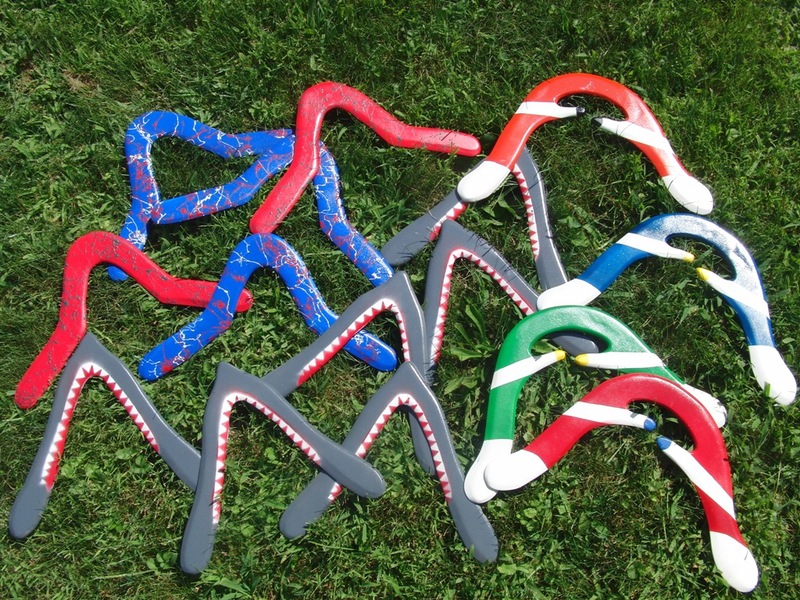 I had some boomerangs which were already shaped and needed to be painted. I made sure I got a good primer coat first and sealed the backs with clear. I had fun making some “Great White” or “Jaws” boomerang. Those of you old enough to reamber the movie “Jaws” will remember the ad with the nose of the shark coming out of the water. This boomerang tried to capture that image. Here are Great Whites getting painted. Check out that stencil I am using. That is between 15 and 20 years old and made from shirt cardboard. My son, Vince, made that stencil and I have been using it ever since. There is alot of dried white paint on it. There are three sharks ready to paint, one finished one at the top and one under the stencil, having just gotten it’s teeth. I painted several other models and the finished results are in this photo. 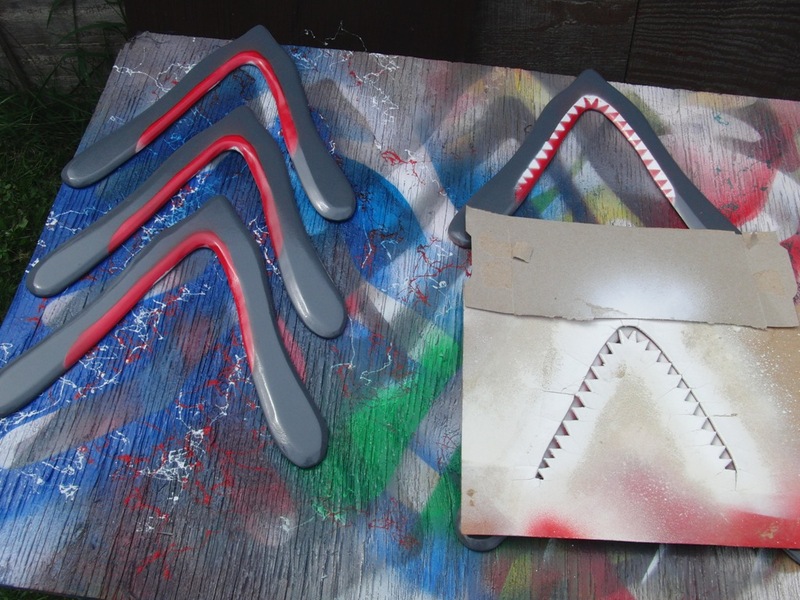 Once I had everything painted, I hit the shop again to shape more boomerangs. I got some unusual shapes done and even 2 cherry lap jointed boomerangs shaped. Now I have to find time to test them so i can paint them too. I really expected to get farther along with boomerangs by now but between a very hot an humid summer, and other activities, I just haven’t managed it. Last weekend I did something about it. I got in the shop and shaped some plywood boomerangs. After that I decided to paint some Roomerangs so that I have them for my craft show the beginning of October. I tried a different technique and think they came out nice. There’s 62 total painted. I ran out of time Saturday to do more but got back at it Sunday. I snuck over to the field and tested the boomerangs I shaped the day before. All went well so I headed home and did a good finish sanding on them. Then I made sure to get a coat of primer on them. I was hoping to get them pained up this week but haven’t found the extra time. More photos when I get them painted.